Definitely there are some fun boxed options out there just waiting at the store for you to quickly grab. But if you are looking for something a little different… something that feels a little more handmade… I have something for you! I need s’more friends like you. You’re s’more awesome than homework. You make class s’more fun. I need S’MORE friends like you! You make class S’MORE fun! I have spent my fair share of years (my oldest is 14) buying the tear-away cards. Now that my older two are in middle school, I have one child taking Valentines to class (did you just hear angels sing? (I totally just heard angels). Oh, and that one child has 12 classmates. If I had 3 kids with 25-30 classmates each – NO. At that level, even tear-away cards make me want to cry. So, to keep life and amazing in perspective, we made 12 s’more Valentines. I mean. Who is really the winner here? This was one of my easiest school Valentine years EVER. Plus… to be honest, doing little crafty things is fun for me and especially Lucy. And it’s especially fun when you don’t have to make/guide your children in making NINETY CARDS. I want you to feel the love, so I am making these available for free to you! Simply click on the photo or text link, download… and print! Free download link to “You make class s’more fun!” here!BUT WAIT THERE’S MORE! Free download link for “I need s’more friends like you!”here! -Download and print the image. You should be able to print this without altering… but individual software and printers sometimes like to pose challenges. I didn’t have card stock on hand and I refused to make life and fun hard and settled for the printer paper at home. Card stock would have been nice, but wasn’t a deal-breaker. Getting in the car and driving would have been the deal breaker. -Insert a graham cracker (broken in half), one half of a Hershey’s bar, one heart-shaped marshmallow (here’s fun Peeps hearts!) in to a sandwich bag (I found cute heart baggies as luck would have it). Standard sandwich bags are 6″ x 6″. I found these cute bags on Amazon. They are 6″ x 4″ and work great too! -Fold the print in half and staple. -Be sure to have child sign and write the name of classmate BEFORE attaching to bag. Of course we had extras. So I made our own Valentine s’mores. Broil on high for a minute or two or bake at 500 for a minute or two. But watch closely. Marshmallows are highly flammable. I may or may not be speaking from first-hand experience. OK guys… Have fun! And Happy Valentine’s Day! Don’t forget… St. Patrick’s Day is coming up! Get your One Lucky Mama 3/4 sleeve t-shirt HERE! I am sorry the download wasn’t working. I have finally corrected the issue. I am so sorry it wasn’t functioning when you needed it. Hi Jenny. Your download link isn’t working. Do you think you could email a copy of the “you make class s’more fun” printable. Thank you!! 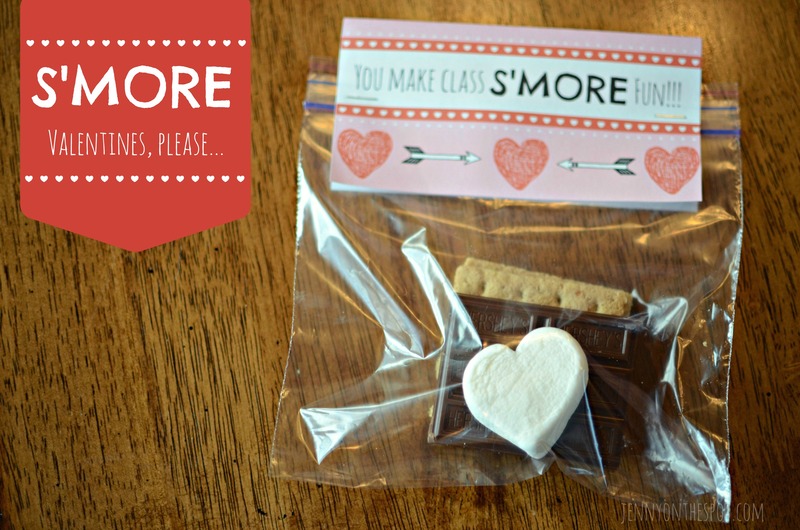 Love these “You make class s’more fun” valentines, but the link isn’t working. Can I find it somewhere else on your page? Thank you!! I am very sorry the download wasn’t working. I have finally corrected the issue. I am so sorry it wasn’t functioning when you needed it. I love this idea and am really looking forward to assembling them with my kindergartner. But as a few people posted last year, the download link won’t work. Could you email me the download or repost? Thank you so much! Hi Krista! I updated the download links! They should be working now! So sorry about that!